Fewer men have ever looked as good on the first tee as Sean Connery did as James Bond, facing off against his unscrupulous nemesis in the golfing scene from “Goldfinger”. 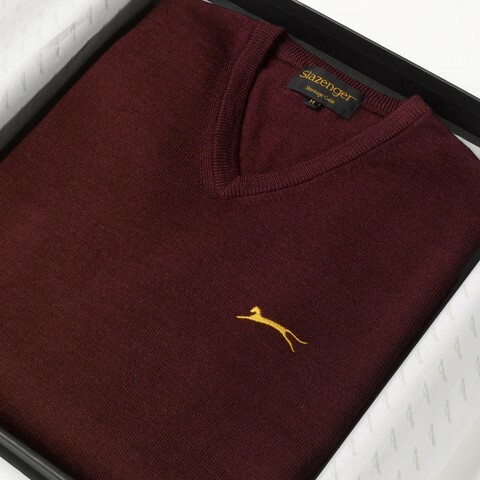 Bond looks effortlessly stylish and poised in his burgundy v-neck from Slazenger, with its distinctive yellow-gold embroidered panther logo. The panther logo was released one year before the movie. This ensemble seems timeless and classic today, but it would have been considered very modern at the time the film was released. For example, the famous Slazenger “Panther” identity was originally devised in 1963, the year before the movie was released, and would have been mostly unknown to cinema going audiences. It’s fairly safe to say that Connery’s choice of sweater for this scene brought worldwide attention to Slazenger. It was this iconic scene and Connery’s stylish ensemble in “Goldfinger” with Anthony Sinclair trousers that inspired Anthony Sinclair and Slazenger to collaborate with Slazenger Heritage in 2014 with a view to recreating the iconic v-neck sweater to commemorate the 50th anniversary of the classic James Bond film. The collaboration between Anthony Sinclair and Slazenger Heritage resulted in hundreds of hours of research. Examining countless photographs, design sketches, and period garments, to ensure that the resulting product was something that would be not only faithful to the original garment but also meet the exacting standards of both Anthony Sinclair and Slazenger Heritage. The logo itself was one of the most difficult aspects to achieve. After examining hundreds of screenshots, sourcing original period sweaters, and scouring the Slazenger archive for original artwork, the exact logo used on the “Goldfinger” sweater was finally identified. This logo underwent further rigorous testing to ensure the correct colour and weave, until finally it looked exactly as the original had done in 1963. It is this logo that appears on the Slazenger “Legend” v-neck sweater. The legend jumpers is a limited series As this was to be a limited edition, it was important that the final garment should not only be luxurious, but also reflective of the modern customers needs. With this in mind, the fabric chosen for the “Legend” sweater was a superfine two-fold Merino wool, chosen for its softness of handle and for its impeccable history as a premium fabric for performance athletic wear. Merino has incredible properties, including body heat regulation, drawing moisture away from the wearer’s skin whilst also repelling water from the outside, whilst also having an excellent warmth-to-weight ratio, which allows it to be not only light but warm. On top of which, Merino wool has resistance to pilling, pulling, and abrasion, making it durable and practical. The “Legend” v-neck is also fully machine washable and TEC (total easy care) treated to allow it to be tumble dried, meaning the garment will last for many years to come. The end result is an exquisitely made product, made to the precise specifications and the stringent standards of both Anthony Sinclair and Slazenger Heritage.